Fourth Row Center: Film Writings by Jason Bailey: On DVD: "Tinker Tailor Soldier Spy"
On DVD: "Tinker Tailor Soldier Spy"
Tomas Alfredson’s Tinker Tailor Solider Spy is an uncommonly intelligent motion picture, a spy thriller that is less interested in gadgets and explosions than it is in pauses and looks. Based on the novel by John le Carré (earlier adapted into an acclaimed BBC miniseries), it is a complicated film, requiring the sort of attention and patience that audiences can no longer be relied upon to bring to the theatre. It’s the kind of movie we’re always hearing they don’t make anymore, until they do. And here it is. The story is pretty standard stuff; a mole has infiltrated the highest levels of British intelligence, and must be flushed out. “There’s a rotten apple,” the agency head, known only as Control (John Hurt), tells his agent, Jim Prideaux (Mark Strong). “We have to find it.” And with that, he dispatches Prideaux to Budapest to get the mole’s name. The agent is promptly shot. 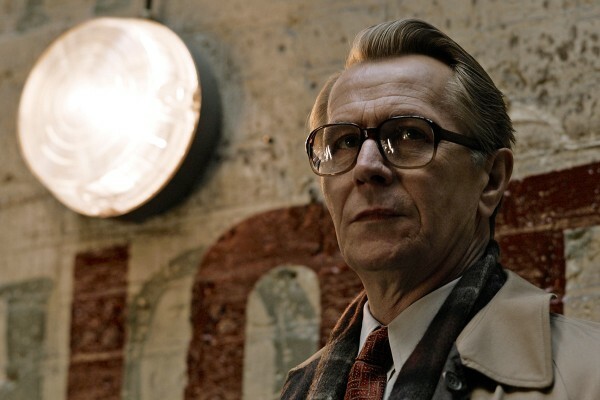 Control is dismissed, but after his death, his deputy George Smiley (Gary Oldman) is asked to investigate the mole. He narrows it down to four men: new agency head Percy Alleline (Toby Jones) and his deputies Bill Haydon (Colin Firth), Roy Bland (Ciaran Hinds), and Toby Esterhase (David Denick). And thus, slowly, methodically, Smiley sets out to find his man. Alfredson, working from a screenplay by Peter Straughan and the late Bridget O’Connor, trusts us to piece together who is who and who does what; in this regard, the distinguished cast of recognizable actors (which also includes Tom Hardy and Benedict Cumberbatch) is an indisputable asset. But beyond mere practicality, the film also offers the opportunity to watch some of our finest character performers squaring off, and working with more than the meager material they’re often saddled with in their small supporting turns. You’ve seldom seen this many fine British actors in a non-Harry Potter picture; there are so many good roles that even the smaller ones are filled by interesting young actors, like Christian McKay (from Me and Orson Welles) and Stephen Graham (who plays Al Capone on Boardwalk Empire). Having this set of familiar faces in place allows Alfredson to just get on with things, indulging in the kind of elliptical storytelling—filled with flashbacks, detours, and dead-ends—that is le Carré’s stock-in-trade. The director’s style isn’t flashy, and he’s not prone to histrionics; it’s a deceptively low-key picture in which voices are seldom raised. But Alfredson has a sure sense of exactly when to get in and out of a scene, and he can build tension with the basic tools of lingering close-ups and Alberto Iglesias’s moody score—few scenes have more crisply conveyed that horrible realization that you’ve stepped into a bear trap like the fumbled early operation, and it takes real skill to build the kind of suspense Alfredson does in a scene involving the theft of a log book. The supporting cast performs admirably, with particular kudos due to recently minted Oscar winner Firth, who is doing some utterly extraordinary things in his final scene with Oldman. A few moments don’t play (the final bit of dialogue between Strong and a young student is a bit on the nose), there’s a bothersome loose end or two, and the low-key pacing may occasional test even the more patient members of the audience—to say nothing of the extraordinarily complicated story mechanics, which took this viewer a second viewing to fully comprehend. Tinker Tailor Soldier Spy is, it must be noted, a far more quiet and deliberate motion picture than the ads suggest. But it’s a doozy nonetheless. "Tinker Tailor Soldier Spy" is out today on DVD and Blu-ray. In Theaters: "4:44 Last Day on Earth"
In Theaters: "The Raid: Redemption"
New on Blu: "The War Room"